Go out, enjoy the rooftops! The Torah portion of “Ki Tetze” has the most commandments any parasha in the Torah has: 74 in total: 27 “positive” (do this and that) and 47 “negative” (don’t do this and that). On the surface, all these commandments are dealing with our immediate physical existence, starting with “if you go out to war” and on. But already Rashi (1040-1105) comments of the opening verse (Deuteronomy 21:10) that the real war, the toughest war of all this section is talking about, is the internal war, one wages against one’s own self, one’s own evil inclination. This continues throughout the rest of the reading. The commandments can be understood on a “pshat”, simple level, as directive for a safer, more wholesome living, and, at the same time, as holding deep spiritual messages. During my studies at the Haifa University, I wrote a paper about “the roof in the Arabic houses”. I postulated that by analyzing the roof, I can learn a lot about how the people underneath that roof live their lives and maybe even, see the world. 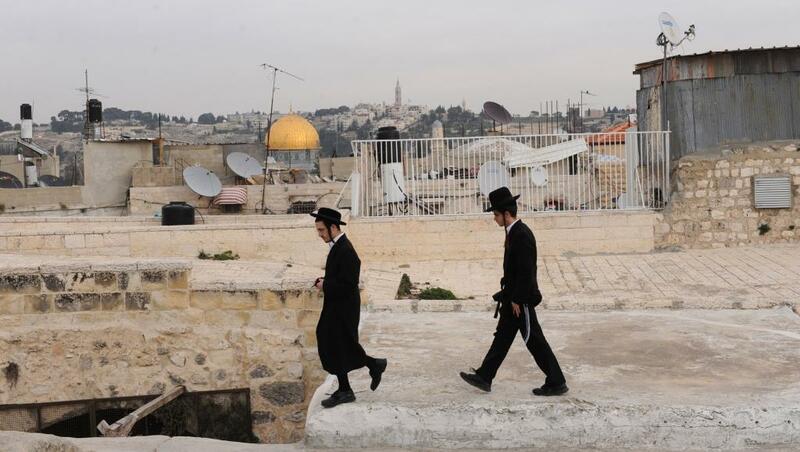 The Torah looks at roofs too. Deuteronomy 22:8 states: “When you build a new house, then you shall make a railing for your roof”… which totally makes sense. In the ancient world, and still in some parts of the world today, the roof is a usable place where one can dry fruits and seeds, hang laundry, sleep in the summer or sunbathe in winter, play, sit and chat and more. Such a roof, should have a railing so no one falls. But, this is so obvious! Does the Torah really need to tell us that? The Kabbalists add a less obvious layer. They play with the fact that in gymatria “gag-cha” – your roof – is numerically equal to G-d’s four letter name (26), and tell us that we should have a railing – or what today we would call “boundaries” – around ourselves to protect ourselves and disallow disruptive things from coming in. Our human “gag” – roof, the highest point in our being is our mind, our thoughts, and much of our connection with the Divine. That part need to be secure and safely guarded. The next verse (22:9) states: “You shall not sow your vineyard with two kinds of seeds; lest the fullness of the seed which you have sown be forfeited together with the increase of the vineyard”. Interestingly, the Hebrew word for “two kinds of seeds” is “kil’ayim”, which literally means – two prisons. Rav Hirsch (1808-1888) explains in his commentary that “two prisons” implies that we are not to mix two different kinds – of seeds or anything that grows, people too. Things that inhibit and limit each other’s growth, that “imprison” each other, and don’t allow mutual growth, have no room in the same “mix”. Our goal should be to strive to develop to our fullest potential; boundaries and a good environment – are key necessities, but something – or someone – who holds us back and restrains us, is a no-no. Elsewhere in the parasha, we’re told that it is a man’s duty to “gladden his wife” (24:5), and yet, what if that’s not possible? In the very same parasha, we’re also given provisions for separation, and even – divorce, for the very same reason of “not mixing things” that imprison each other. And one last for this Shabbat: In the beginning of that chapter (22:1-4) is a famous favorite mitzvah, that of returning lost objects. The mitzvah of hashavat aveda – returning lost objects – is what’s called “a double mitzvah” because the Torah says “hashev teshivenu” – “indeed you shall return”, using the same root-verb twice. There is also an added negative one: “lo tuchal lehit’alem” – “you will not be able to ignore / avoid”. The sages teach us that if you find your neighbor’s lost object you must return it. This too seems to make sense; why state the obvious? Then the sages add: you must return it, meaning even 100 times! That’s when it becomes less obvious and one wonders: really?? 100 times? What can we possibly return 100 times?? So maybe the construct hashev teshivenu does not only refer to returning a lost object but also to another word that shares the same root: teshuva. Tshuva, which we quickly translate to mean “repentance” shares its root with “answer” as well as “return”. If so, this is also about us noticing within us – or others – things that are lost; different qualities that have gone astray, that we forgot somewhere and no longer use to our betterment, like the ox within us symbolizing our insistence and stubbornness who maybe now no longer works for us; or our lamb – symbolizing our meekness and more. In that sense, these are the things we must notice and can’t ignore; the things we must return back to ourselves. Even more than lost objects – a garment, a donkey – and especially in the month of Elul before the High Holidays, this is a reminder for making teshuva with each and every one of our separate, lost pieces – our outer covering, our physical, hard working drive – and even if it takes us 100 times, still, never-ever give up on bringing those back home. This entry was posted in Uncategorized and tagged kilayim, lost objects, Relationships, roofs, tshuva. Bookmark the permalink. 2 Responses to Go out, enjoy the rooftops!